Kinoshita-Kabuki is a theatrical company who presents Japanese classic theatre programs, Kabuki, Bunraku, etc., as “Modern plays”. Based on the historical context, resulting from academic studies and classic style studies, etc., Kinoshita-Kabuki interprets and re-produces the classics from a new aspect. In contrast to the classics of Western, current Japanese theatre doesn’t really take up own classic programs as its subject. However, there are plenty of classic theatre pieces and programs in Japan, and perhaps modern Japanese theatre might take something from the tradition, a goldmine of knowledge. Due to the awareness of abovementioned problem, Kinoshita-Kabuki achieves to be like a salon, which provides an opportunity to contact with own tradition for modern theatre related people, as well as being an active field for creations. Therefore there are no specific actors / actresses belonging to Kinoshita-Kabuki, and the artists shall be arranged by projects. Kinoshita-Kabuki aims to approach Kabuki from various aspects. From such a reason, the company produces the programs with various stage directors designated by each programs. Mr. Yuichi Kinoshita, founder of the company is a supervisor of overall program, a play writer, and a designator for adequate stage producers according to the program. The concept of the creation is specified by Mr. Kinoshita as basis. And he co-works as a partner of designated stage directors. Thus, He takes overall responsibility for the program. Mr. Kinoshita, company president takes a role of a producer and a dramaturge at the same time. So that stage directors shall realize more desirable condition for their creation. Furthermore, present collaboration system aim to develop more modern theatre stage directors who can deal “Classic programs” of own country. Kinoshita Kabuki owns investigation and research team for Kabuki programs. Mr. Yuichi Kinoshita is a researcher of Kabuki, as well as a company president, and he is the leader of the team. The team conducts investigation on historical materials, literature, and an existing performance. Moreover, literary criticism, such as text analysis and examinations into new interpretations are fundamental work of the team. Basically, studies of a program start at one year ahead or earlier of the performance. Then, the findings from the continuous and long –term activity are highly reflected into the creation. And furthermore, the detail of the study shall be summarized into their publication, “Kinoshita-Kabuki Sosho”, to widely contribute to society. Yuichi Kinoshita is founder, supervisor, and dramaturge of Kyoto-based company, Kinoshita-Kabuki. Kinoshita was born in 1985, in Wakayama Prefecture Japan. Kinoshita was shocked by Kamigata-Rakugo performance in his childhood. Based on the initial experience, he has been expanded the region of his interesting to Japanese classic theatre. Kinoshita studied modern theatre at Kyoto University of Design and Arts in the Department of Theatre. In 2006, Kinoshita founded a company Kinoshita-Kabuki, perform modernized classic theatre programs. Kinoshita has been worked as a play writer, a supervisor co-work with several stage directors.As his latest works, Kinoshita produced “Yoshitsune Senbonzakura”(2012, General Director: Junnosuke Tada, Director: Momoko Shiraga, Kunio Sugihara), “Sannin Kichisa”(2014-2015, Director: Kunio Sugihara), etc. 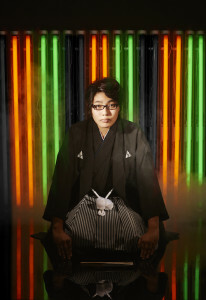 Kinoshita is also active as a writer or lecturer, speaker or host in conferences related to classic performances. Kinoshita is working at his doctorate’s thesis on Takechi-Kabuki. Kinoshita is the recipient of multiple awards and honors, including The SAISON foundation Junior Fellowships (2014), Asahi Group Foundation Subsidy Program (2010-2012), etc.